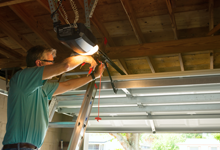 Our team of professional technicians has the ability to quickly and efficiently install aftermarket garage door system upgrades such as automatic detection systems and motorized garage door systems. Because the gaps between the frames and the doors around the edges of many garage doors expose stored vehicles and goods to the open air, our technicians can install insulation to make the garage doors of our clients more energy efficient. When we are working with a client to implement a specific specialty garage door system, the first step involves a consultation so that our experts can understand your unique specialty garage door needs. We then help you select the perfect solution from among our array of options so you have a door with the access and protection that fits your situation. Once we have decided upon the appropriate system, we look to our trusted network of providers to supply us with top-quality components and materials for building the door. The next step is for our qualified technicians to visit the installation site and carefully measure the exact position where the specialty garage door will be placed. After our specialists have installed the door, we do not consider the job complete until we carefully check that all panels are properly aligned and airtight and meticulously inspect the work to pinpoint possible future issues such as wear and tear due to use or environmental factors. Because we are so painstaking in our installation process, our specialty garage door clients in the Northfield area are assured that the doors they have purchased are of optimum quality and will provide protection and security for years.